1. To maintain the Scottish Cemeteryas a managed green space which can be a ‘lung’ for the surrounding population. as inspired by the ideals of Sir Patrick Geddes. 2. 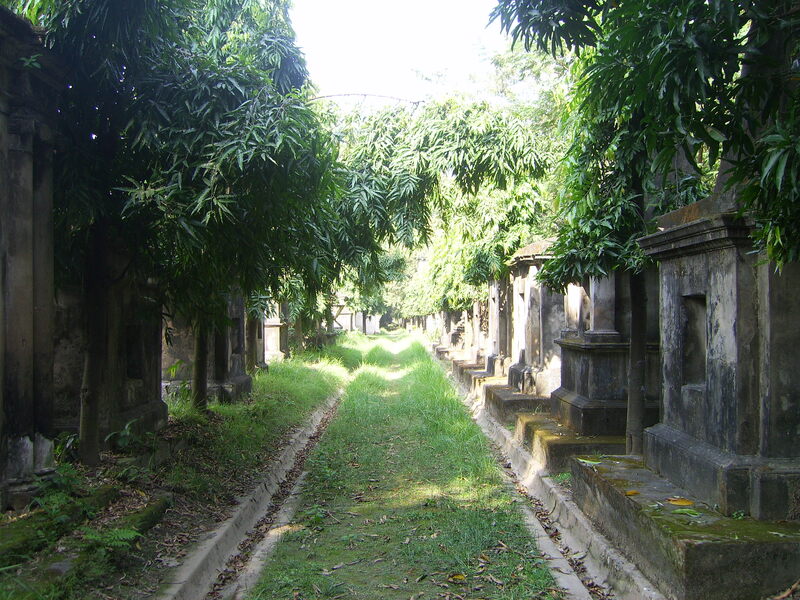 To research and record of the cemetery and thereby improve the understanding of the site, its history and its genealogical importance. To make this information readily available. 3. 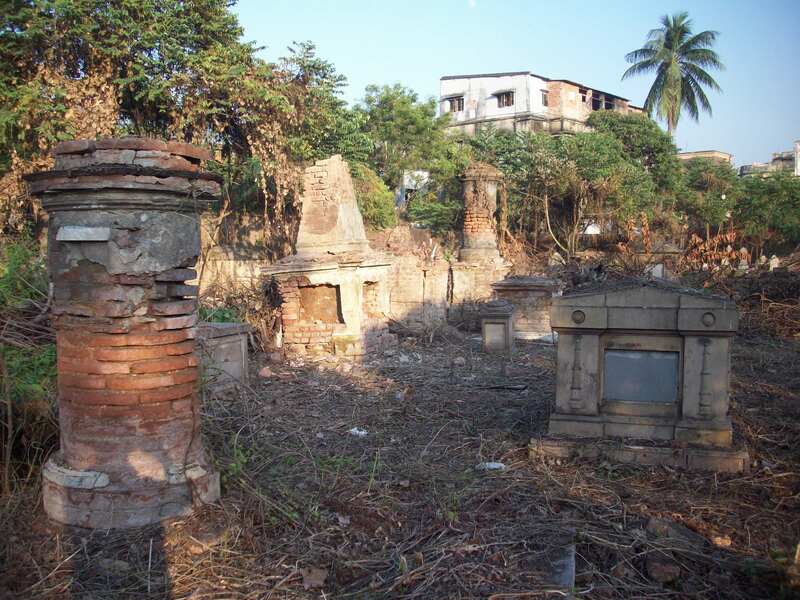 To restore the cemetery buildings and as many of the monuments as possible. 4. 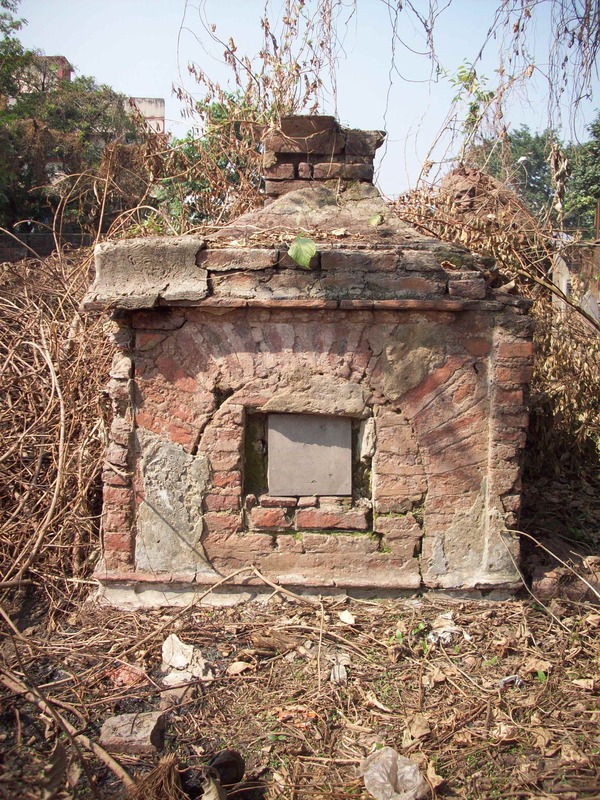 To establish a centre for training traditional building skills necessary for the repair and restoration of the monuments as well as of the traditional buildings of Kolkata. 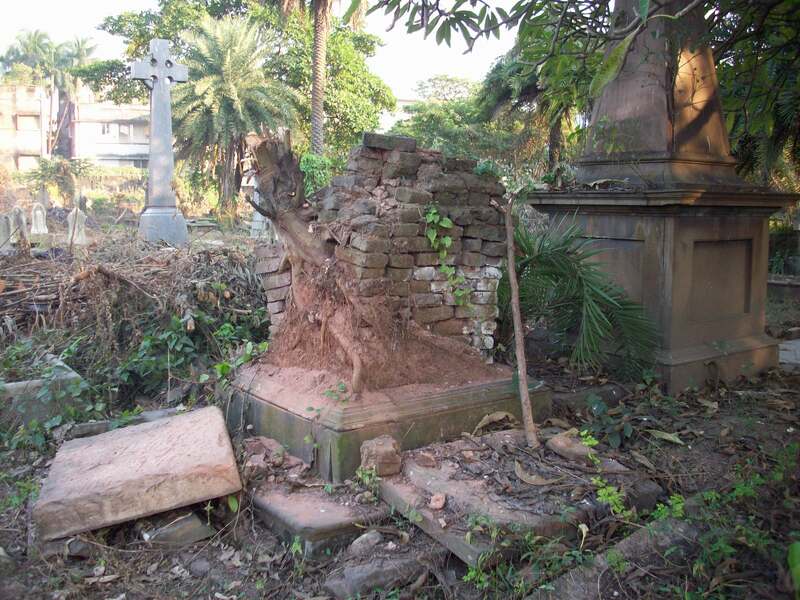 The Kolkata Scottish Heritage Trust are actively fundraising for the project. At this stage donations and enquiries can be handled by the administration team – Elaine Thompson, Beverley Guild, or Arielle Juler at our office here in Leith (0131 555 4678 or e-mail as above); these will be passed on to the Trust. 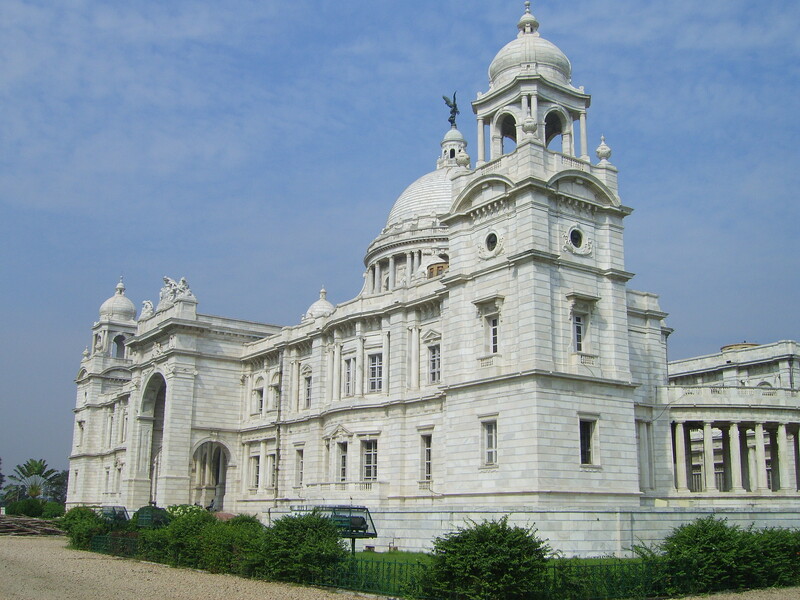 Kolkata, or Calcutta as it used to be, was the headquarters of the East India Company in the 18thC and the capital of India until 1911-12. 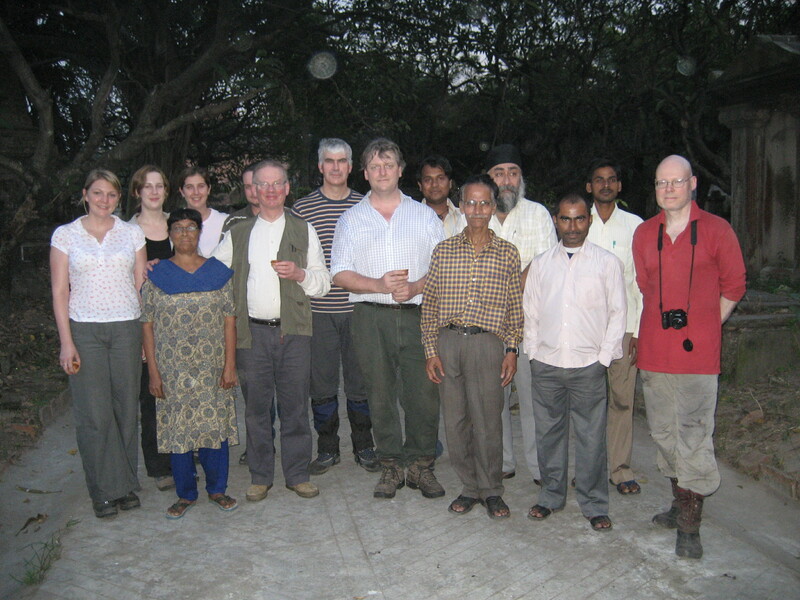 Scots played a prominent part in the work of the Company and in the administration of British India . 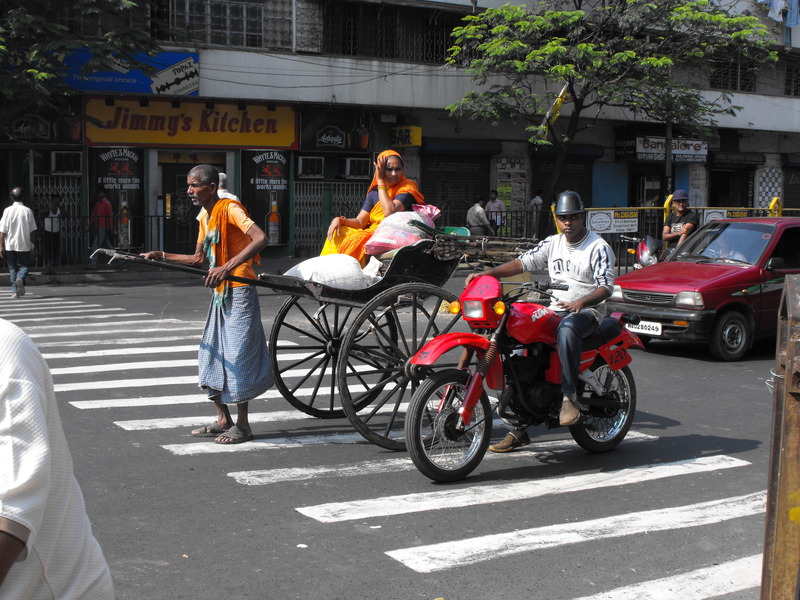 The development of the tea trade and jute trade with Dundee brought many Scots to Kolkata in particular. 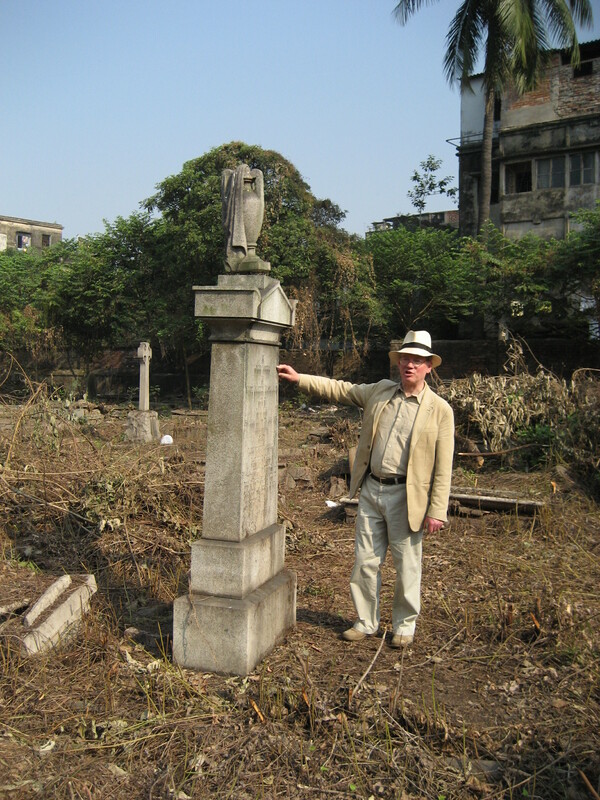 The Scottish church in Kolkata, now part of the Church of North India, was St Andrews in Dalhousie Square, on which the Scottish Cemetery was – and is – dependent. In the Session Room of St Andrews hangs a large photograph of St Giles cathedral in Edinburgh! The cemetery has over 1600 headstones and monuments, some of Aberdeen granite, but many of brick and lime with marble tablets. The Register of Interments in the Scottish cemetery records the names of the many hundreds of Scots who died far from home and are buried there. Well over 90% of the names are recognisably Scots – names like Anderson, McGregor, Campbell and Ross – most of the others are Bengali, like Banerjea and Mukerjee. 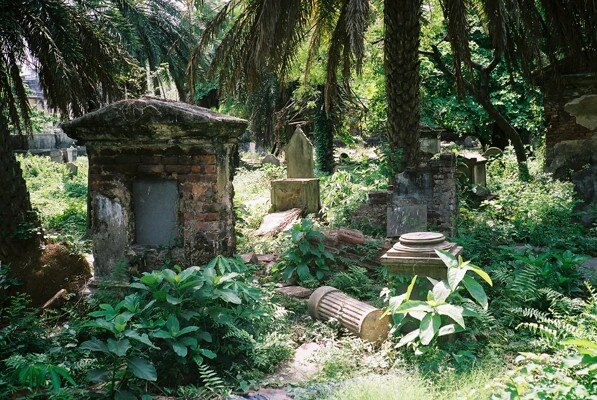 Despite the efforts of the Superintendent, who lives with his family in the arched gatehouse, the cemetery is derelict and overgrown with snake-infested jungle twenty feet high. The monuments and stones which are visible are broken and decayed. 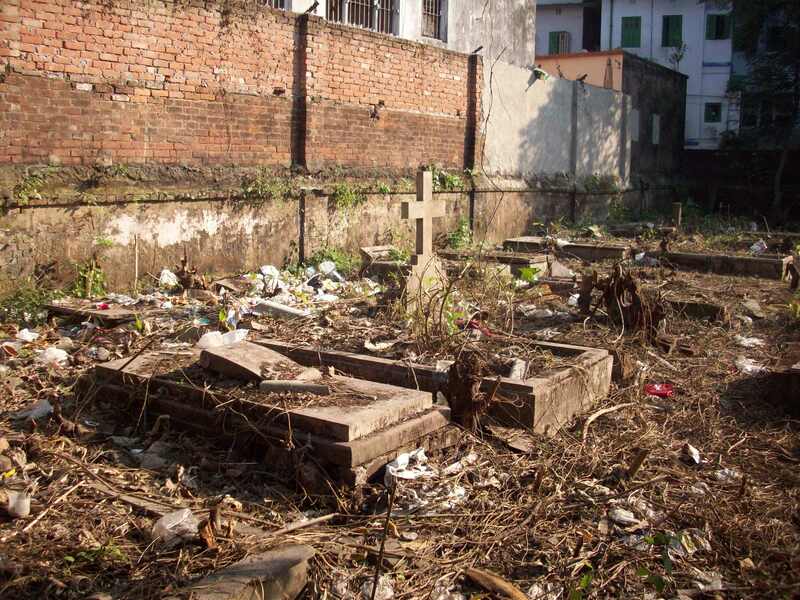 The cemetery, which is a rare green space in a densely populated part of Kolkata serves no useful purpose, either for the City, for the local population or for the relatives of the people who are buried there. It has become a great burden for St Andrew’s and the church in general and a matter of concern for the City and State authorities. Yet it is an extraordinary record of the lives of generations of Scots, a part of Scotland’s heritage overseas and surely a site for which present-day Scots should feel some responsibility. 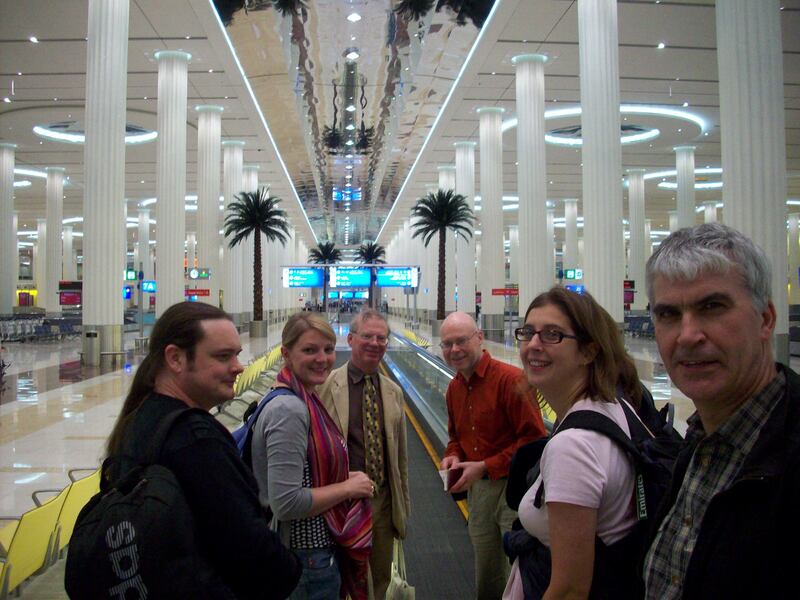 … So here we are on the return leg home, sitting through the night at Dubai airport – time for a catch-up. The dinner last night was a success … many wonderful and curious conversations with our Bengali guests – one lengthy discussion on the Wealth of Nations … another in response to penetrating questions such as what had motivated the Romans to invade Scotland … wits stretched within our muggle-heads; wonderful descriptions had of the country, particularly Darjeeling, friendships cemented. Nick proved something of a hit with the lady guests …. Inspired after having come across Maj Gen ‘Hindoo’ Stuart in the South Park Street cemetery, the team re-christened James (*see below). The jackels around the hotel surpassessed themselves last night – was convinced it was the team having a mad cackling fit, but no …. 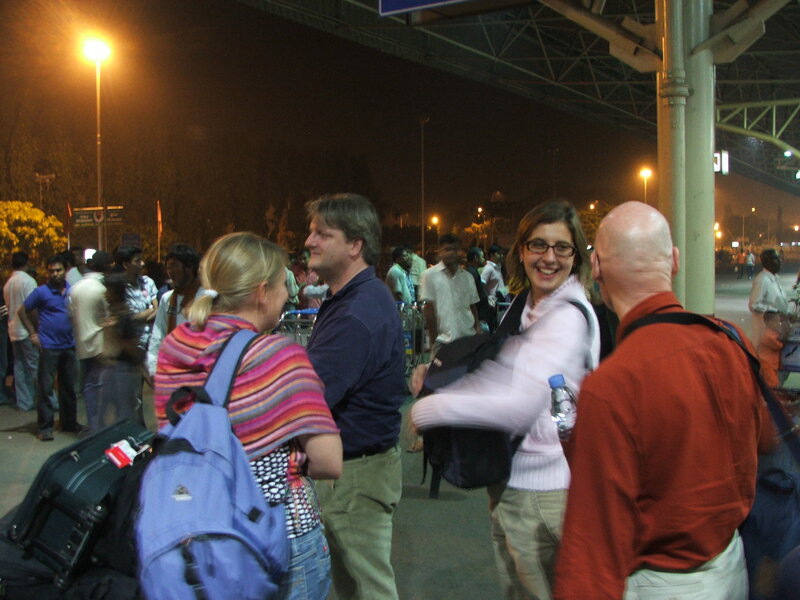 Potential international incident at Calcutta airport as Steve walks through the Ladies’ security file only to be rumbled behind the screens by a formidable female guard in military fatigues whose look was glacial in the extreme …. The majority of the team now suffering with lesser or worse ailments (many unscheduled trips to available facilities) – the long trip back is proving very hard work – but definitely not looking for sympathy upon our return …. Once they are sorted we will be posting photos of the trip when back in Scotland (Monday or Tuesday) and some additional material – so please stay in touch…. Last day of site work. Today was not only notable for the end of our work in Calcutta but also for the lamentable defeat of England in the second one day international in Mumbai by 158 runs (the defeat earlier in the week was little better) – India on a high after brutalising Australia in the test series – so not all bad news then … just as well we are a Scottish exprdition. Friday was also auspicious for India’s successful ‘suicide mission’ to the moon (???). All working industrially to a common goal today … (?!) … Early in the morning was told by an itinerant Irish graveyard researcher that many locals don’t visit the site because it gives ‘crazy dreams’ … this has certainly been the case for the the author the last two nights … strange visions of recording sheets and crumbling stone …. 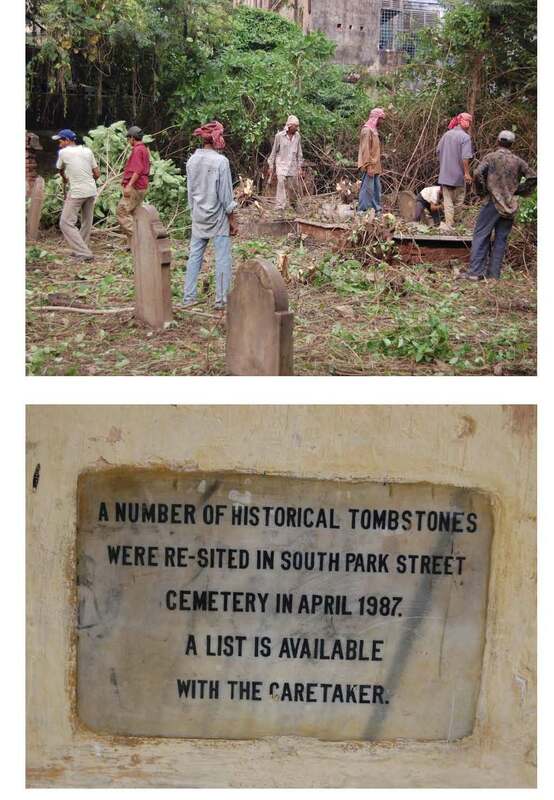 Traced many of the missing inscription tablets to South Park Street Cemetery nearby … this a Piranasian wonderland under a shady tropical canopy – (try googling it). 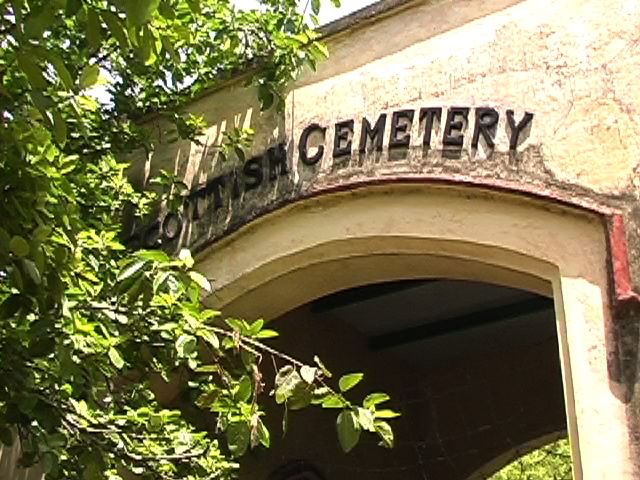 Many Scots were buried there before the Scottish Cemetery was established in the c1820s. The contrast is extraordinary …. the comparative simplicity of the Scottish Cemetery is very marked. 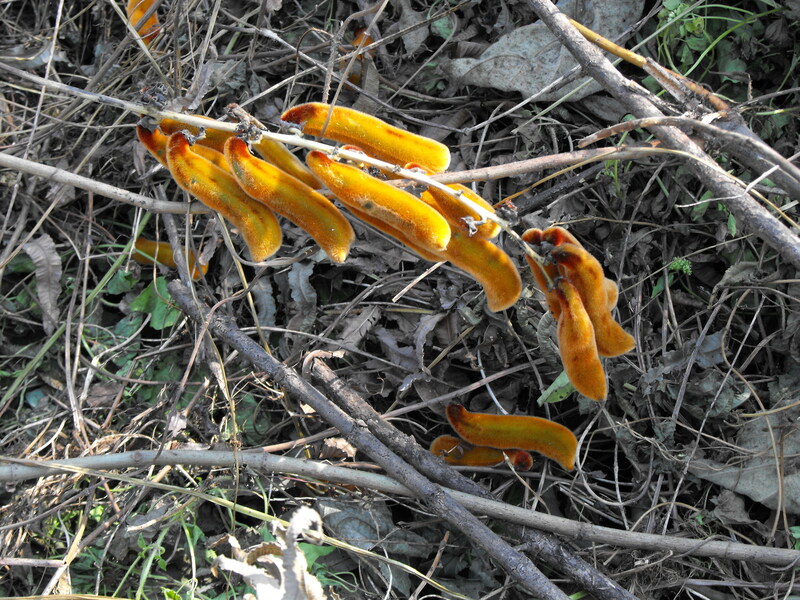 One case of burning itches today – the culprit a hairy orange seed pod named snow poker … not quite sure why ….. The usual pre-lunch ratty phase – just as the heat exhaustion begins to take hold – recommendations for local eating houses invariably led to long walks in the sun or standstill in traffic until utter desperation sets in …. However it is worth mentioning lunch at Kewpies, purveyors of traditional Bengali cuisine, recommended to us and perhaps the best meal of the week. We required considerable nannying by the long-suffering waiters to ensure banana leaves wern’t consumed and ‘no, that’s not a cricket it’s a vegetable…’ – general despair on their part. Tom was served cumin-flavoured mango juice in goblets of eastern Mediterranian Roman slipware … in consequence the establishment was liberated of its crockery and any other momentoes that weren’t nailed down …. shameful to say. Further compared notes on the delights of site-work … attack by giant black ants, bad mozzie bites, well aimed brid droppings and other unmentionables. Loretta very pleased with a large bunch of gladioli as vote of thanks (but even more gratified to finally have her kitchen table and chairs returned). Exhausted team paraded for group photo – grins either of relief or nailed on .. but final cup of sweet tea to finish off. 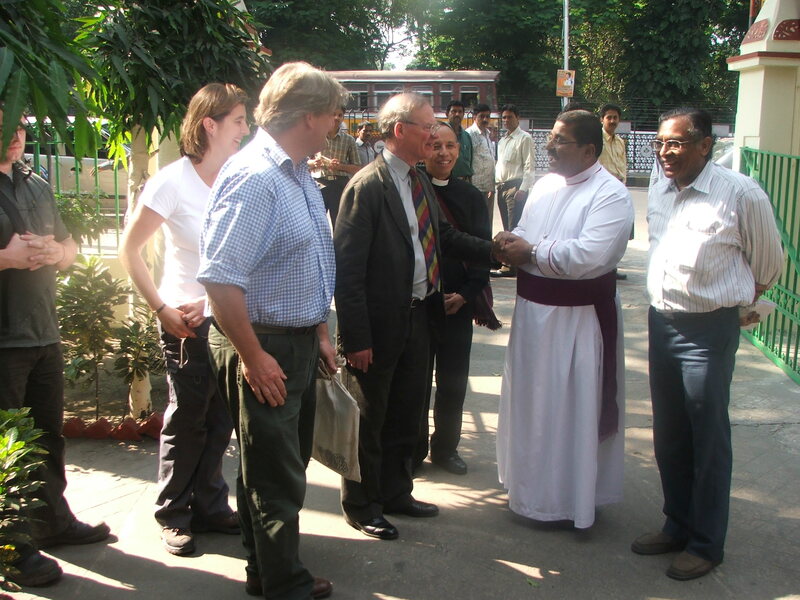 More to add in due course, and pictures too, but must leave for imminent end of project dinner – invited guests local friends including Bishop Biswas of Kolkata. Team on best behaviour…. Plodding along on site … flocks of kites hovering and swooping down upon us throughout the morning; overcast for much of the day providing slight relief; our resident pack of 5 feral dogs sprawled out beneath the franjipani in the late afternoon sun; a crow munching upon a bat …. some drug use evident at the nether regions of the site – well avoided. Clare harrassed by children – repeating ‘Halooo, halooo, halooo, halooo…. ‘ for hours on end. 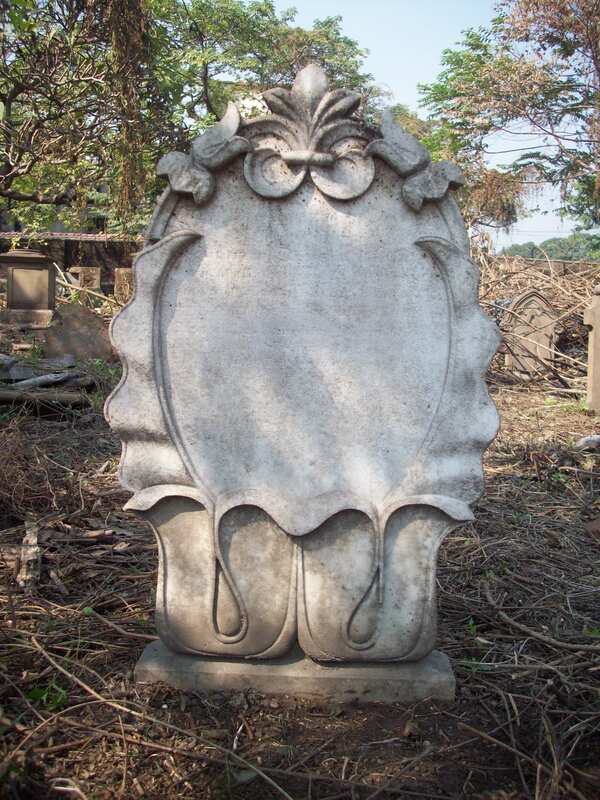 Seeking out some of the more interesting personalities within the wider cemetery – a Glasgow iron master named Boyle, the Director of the Calcutta Zoological Gardens, officers of the Honourable Company, The Rev. 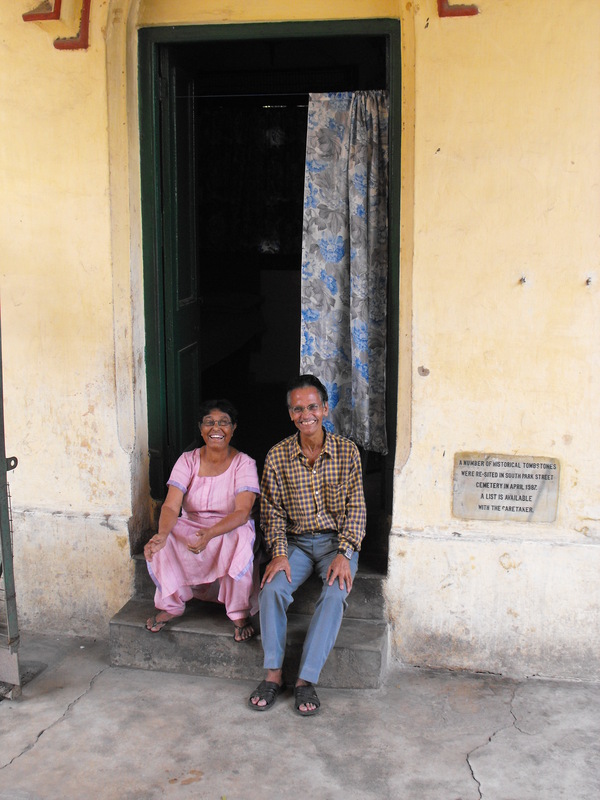 John Adam ‘late Missionary to the heathen …’, umpteen jute mill staff, etc, etc. With the detailed recording of graves in our chosen quadrant of the cemetery going steadily but slowly, a more tageted approach to recording the area was decided upon – detailed grave recording forms will be completed for about half the quadrant; all artistically or historically significant graves will be recorded by formal photograph; all others will be covered by a general photographic database of images; the evoultion of wider cemetery is being examined – with rapid expansions of the original 1820s-40s cemetery to the S (1850s-60’s), and, withthese areas becoming increasingly overcrowded by the 1860s, to the E – the latter in sccessive stages, taking in new land as required. The intensive use continued to the mid 20th century, with only occasional burials thereafter….. squeezed into any available space. 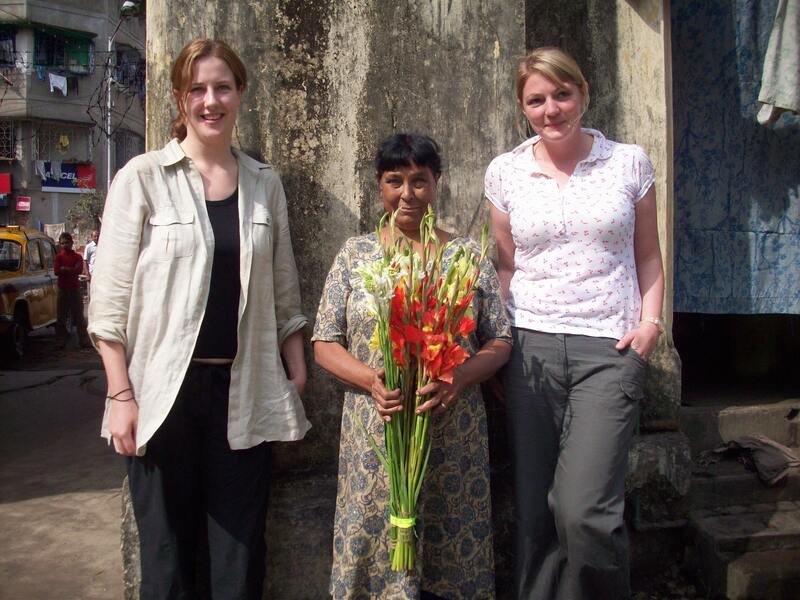 James’ gift of flower garlands to Rajpal, our Sikh driver, in celebtration of the birthday of the first Sikh guru, Guru Nanak – were received with embarrassment – perhaps a little too forward on James’ part … ! While the team was working in the hot sun, making steady progress with the recording, James skived off to do other things! 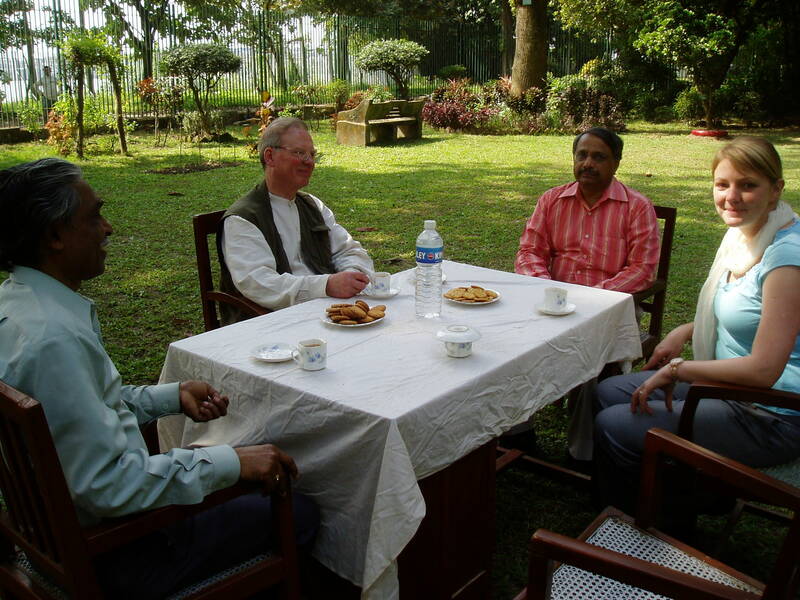 In the morning he met the Director of the Botanical Survey of India at the Calcutta Botanic Garden on the far side of the Hooghly River. The purpose was to see the garden buildings, particularly the house built for William Roxburgh, first paid Superintendent of the Garden in about 1790. Remarkably, though empty for twenty years and in a state of gentle decay, this wonderful late Georgian villa, whose bowed first floor veranda has spectacular views of the shipping on the river, is essentially intact. 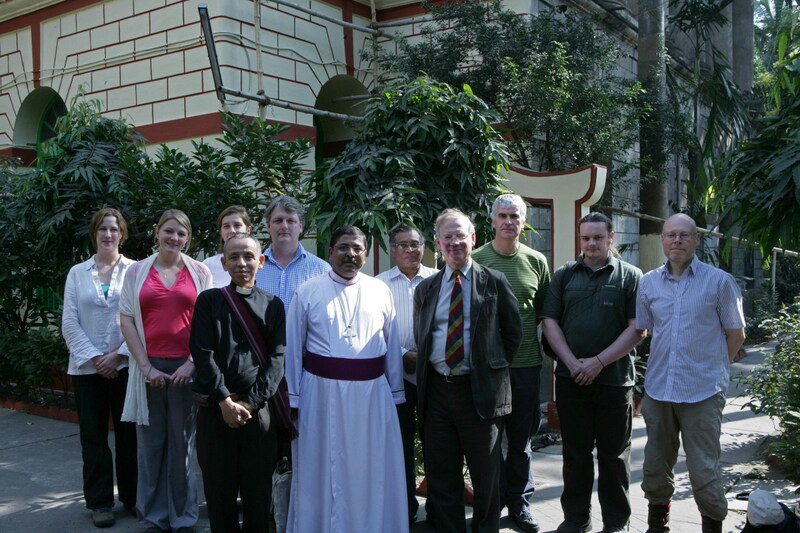 James afternoon visit was to meet the Bishop of Calcutta and elders of the church established by Alexander Duff in the 1830s, along with the Scottish Church College, still regarded as one of the two best colleges of the University of Calcutta. Technical difficulties afflicted Tuesday’s blog update – apologies, but here now …. Team launched in earnest on site. 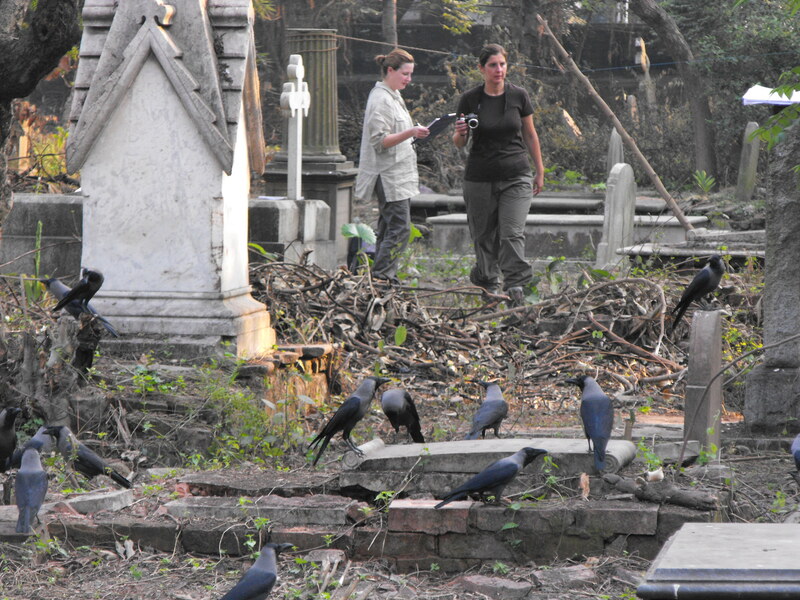 The systematic graveyard recording exercise – overseen by Amanda, with Nick, Laura and Clare – is now progressing steadily. The enormous variety of monument type, construction material, very varied condition and accessibility is proving challenging. Steve Wallace of the RCAHMS targeted a variety of monuments about the site, taking advantage of exceptional light conditions to take a wide selection of general site shots and monument details; he and Clare also initiated a systematic phoptographic survey within the sample area. The cemetery lodge was surveyed by Laura and Clare, this much to the amusement of local children and admiring teenage boys. An informal open public bath on the pavement immediately outside the gate proved no obstacle, despite the flagrant immodesty. 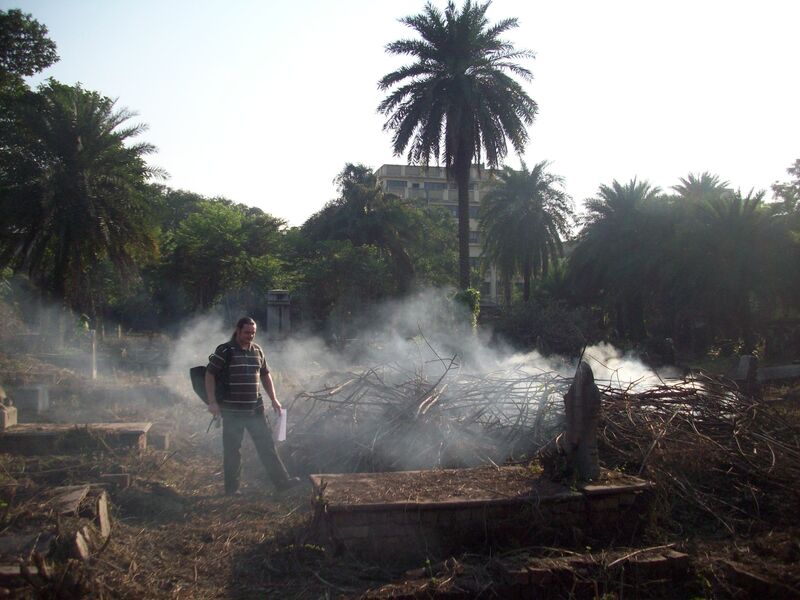 Manish and Joydeep, of Continuity Architects, organised a general condition survey of monuments. Undertaken by Joydeep, it may well be possible to cover the entire site by the end of the week. Sweet tea delivered twice to site today – collecting the disposable terracotta pots as souveneirs is becoming a past-time, to the astonishment of the locals – collecting these disposable items must seem like collecting Big Mac boxes. Teenage locals given short shrift by Norman & Loertta, the custodian and his wife. In the absence of snakes, rats made their appearance (snakes were clearly a good idea … we now regret). 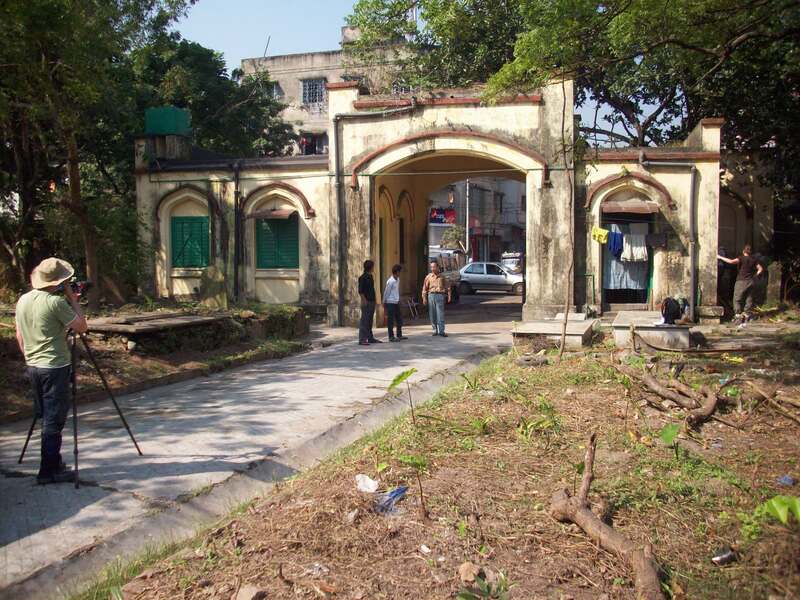 At the invitation of the British Council, James led a workshop in the Bengal Club attended by about 50 of the great & good of the heritage community of Calcutta. 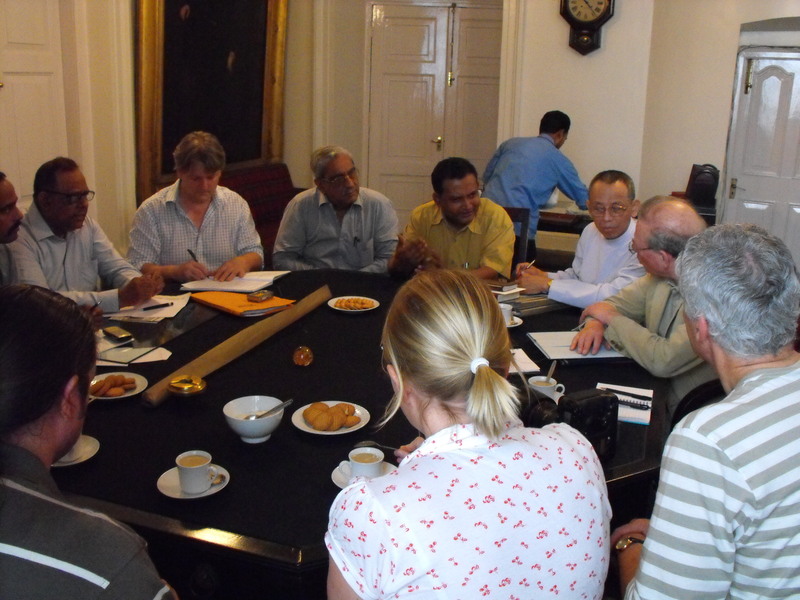 The event was chaired by Professor Barun De, chairman of the West Bengal Heritage Commission. Amazingly, Professor Barun De spent three years in the 1950s working in the National Library and the Register House in Edinburgh on a thesis on Henry Dundas, Viscount Melville – the man on the top of the column in St Andrews Square! So he understood all James allusions to Edinburgh and comparisons of the two cities. 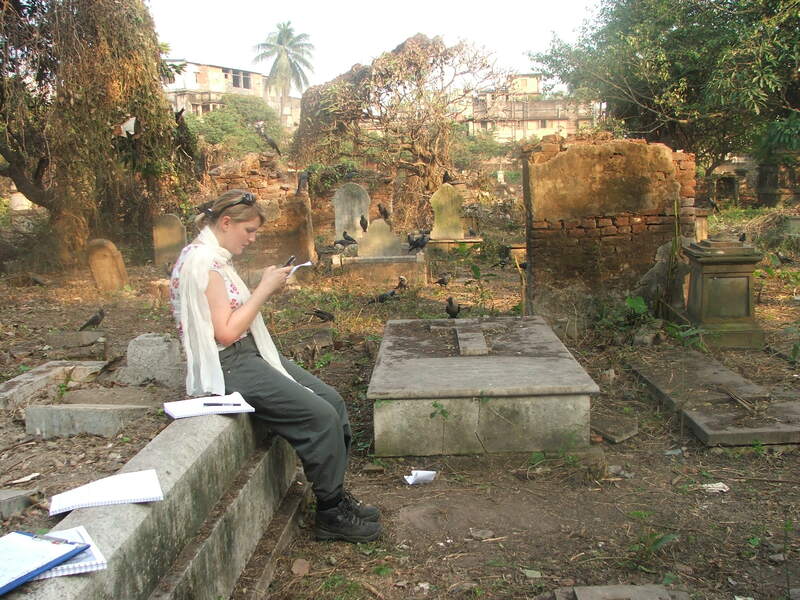 Returning to site the Times of India descended upon the team for an interviewed piece – a curiously posed photograph of the entire team recording a single headstone may make the Sub-continental media on the morrow…. The team arrived safely after a marathon journey and something of a culture shock upon a traffic-ridden whirlwind tour in Dubai city – only one team member intrepid enough to put a toe in the Persian Gulf (does this bode well?). 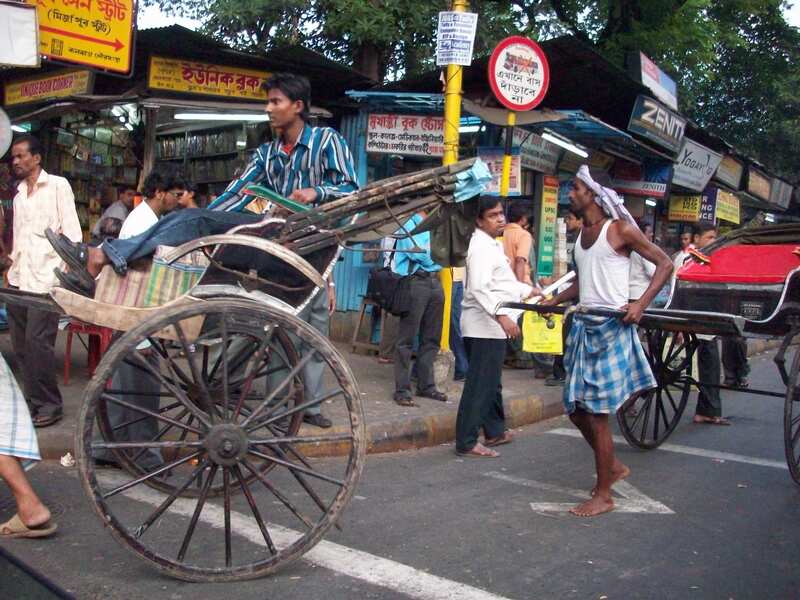 Even greater but considerably better culture shock upon night-time arrival in Kolkata – as one might imagine …. A very friendly meeting and warm welcome at St Andrew’s Church – tea and biscuits. 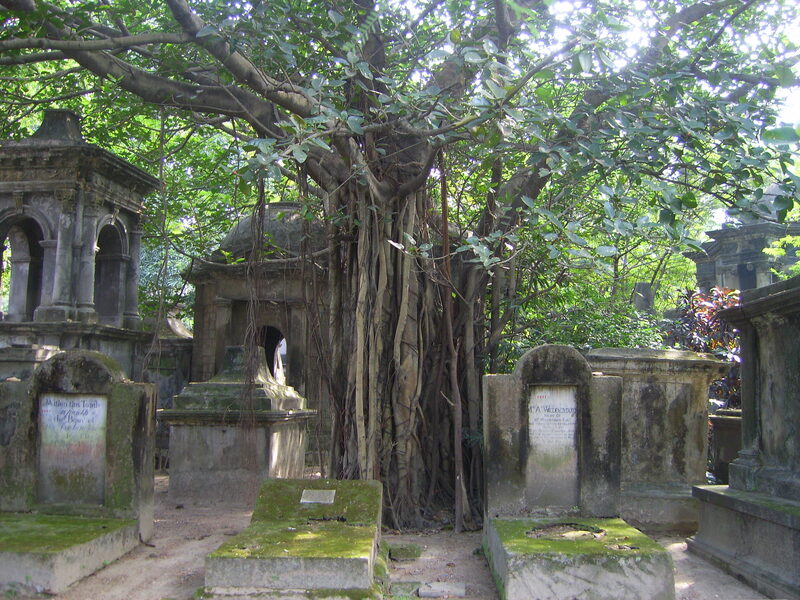 The cemetery gatehouse suddenly loomed after forcing our taxis through one of the most hap-hazard street-scapes in the world – newly-cleared, a vast expanse of crumbling remains, the occasional banyan and palm still standing and enormous piles of newly-felled bush. The good news was that no snakes emerged during clearance so we may make it through in one piece …… Today we explored the site and assessed what might be done – with all the planning in the world one has to accept that there must be some adaptation and considerable flexibility required – day 1 is certainly the most worrying moment. So … we simply started by plunging right in with each of our planned for tasks as a tester ….. ancient and venerable Scots are now begining to emerge from the jungle to be photographed, planned, described and assessed – we have already encountered many jute workers, a tea planter, an American sailor, Anglo-Indians and the odd dissenting Welshman. There is great poignancy here – so many expired at such a young age … the towns and villages of origin are scrupulously recorded … Duffus, Paisley, Broughty Ferry, Sutherlandshire, Inverkeithing, Fife, Campbelltown, and many from Dundee …. 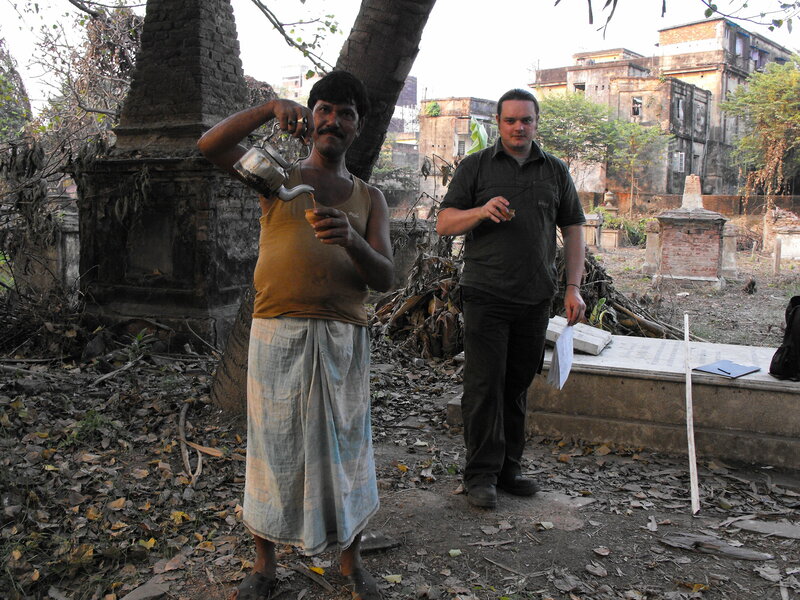 Sweaty and swooning (that’s us by the way), we were revived by a hot cup of strong sweet tea brought to us in miniature deisposable hand-thrown pottery cups … organised by Manish Chakroborti, our host architect and cemetery expedition collaborator …. The RCAHMS attachment suitably pulling their weight, you will doubtless be glad to hear ….. ! We compare notes this evening and plan for the rest of the week over a Kingfisher or two…. p.s. James, Nick, Clare and I were all interviewed on film by a Reuters journalist almost as soon as arriving on site – tried desperately to sound reasonably in control of our faculities – look out for the press exposure …. ! In preparation for the survey, a team have been working hard to clear the overgrown site for the past 2 weeks. They have uncovered many interesting monuments.